Peter Kelsey started as a busboy at the old New French Cafe and now runs a Minneapolis bakery with 400 employees and customers ranging from Surdyk’s to Target. via Blunt-talking Minneapolis baker named Small Business Person of the Year | StarTribune.com. This entry was posted in Uncategorized and tagged Business on April 30, 2013 by Peter Fleck. My name is Tracy Singleton and I write to you as both neighbor and neighborhood businessperson. I own three adjoining properties in Seward: my home of almost 18 years at 2501 33rd Ave South, the neighboring house at 2505 33rd Avenue South, and the Birchwood Cafe, the business I’ve operated for almost 17 years at 3311 East 25th Street. This entry was posted in Uncategorized and tagged Business, CDC, events on August 24, 2012 by Peter Fleck. Zipps is having a garage sale! Saturday is just around the corner. It will be a busy neighborhood garage sale day for sure, and the best one will be at Zipp’s from 10-2! We had a bunch of hard working young men clean out our basement today to clear out all of the promotional crap we have collected over the years and we are going to sell it to you! Every price will be negotiable and all of the money goes to the Susan G Komen 3-Day! Let’s drink a bunch of rosé and eat tasty appetizers at True Thai. Tom from The Wine Company and myself are planning on doing just that and we would be honored if you joined us. Let’s learn a little more about our favorite summer wines and rediscover just how freaking food friendly they really are. $10/person. Please call 612 333 8686 to reserve your spots. Space is limited! This entry was posted in Uncategorized and tagged Business on May 16, 2012 by Peter Fleck. TV and typing make a great combination. Experienced transcriptionists wanted to help us create the best closed captions in the business. Are you a skilled transcriptionist who’s transcribed enough corporate meetings for this lifetime? If so, submit your resume to CaptionMax and get to work transcribing all manner of television programs. Help make media accessible for the Deaf and Hard of Hearing audience. Requirements: Accuracy. A Skilled Ear. Broad knowledge base. Transcription Experience. High-speed internet connection. This entry was posted in Uncategorized and tagged Business, employment on February 28, 2012 by Peter Fleck. Emily Moore Harris and Sheela Namakkal made a big splash even before opening Cake Eater Bakery & Café in the former Clicquot Club space in South Minneapolis’s Seward neighborhood. Sheela had built something of a reputation around Miel y Leche, a catering business that sold to individuals for weddings, birthdays, office parties, and to select venues around town, including the Modern and Quixotic Cafe. 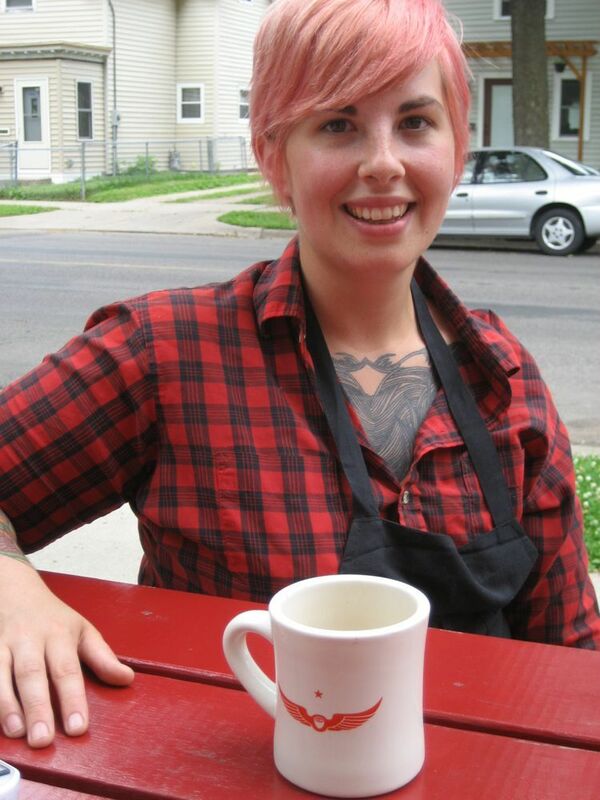 Emily was well-known up and down Lyndale Ave., having worked at Caffeto, the Wedge, Ecopolitan, and Treehouse Records. Then, a few months prior to opening their business in April 2010, the vivacious duo began introducing themselves—and their delectable wares—to Seward residents at various events, including a benefit for the Seward Neighborhood Group, and the first annual Franklin Frolic, both at Welna II Hardware. This entry was posted in Uncategorized and tagged Business, Food on July 9, 2011 by Peter Fleck.